In Saturday’s concert performance of Bernstein’s Chichester Psalms and Beethoven’s Ninth at the Keefe Center for Arts, Symphony NH, along with members of the New World Chorale, lifted their instrument and voices in an expression of unity and brotherhood. A recipient of the 2016 and 1017 Solti Foundation U.S. Career Assistance Awards, Patel is one of America’s most exciting up-and-coming young conductors. He’s currently in his third season as the Associate Conductor of the San Diego Symphony and is also the Associate Conductor of the Sun Valley Summer Symphony. 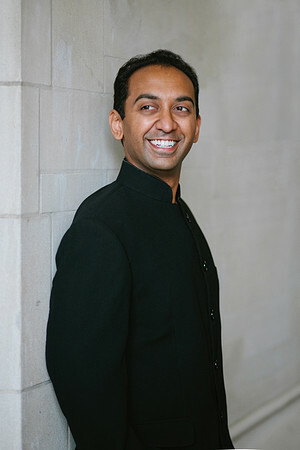 In the 2017-2018 season, Patel is conducting two programs with the San Diego Symphony Orchestra. He also leads operatic masterworks with the Sacramento Philharmonic Opera and conducted modern masterpieces with the La Jolla Symphony. Patel has his own history with the pieces performed during Symphony NH’s final performance of the 2017-2018 season, forming a connection to Bernstein during his teenage years and finding Beethoven’s Ninth still relevant to our modern age despite its 19th century origins. Under Patel’s direction, Bernstein’s composition, colored with gradients of opera and jazz, paired with Beethoven’s radically dissonant but serene lines, communicated to the audience a sense of coming together in the face of tension and conflict. Also adding to this message was the collaboration of the orchestra with the New World Chorale. Contributing his voice to the harmony as the symphony’s youngest soloist was Miles Luther, a seventh grader at the Lincoln School in Brookline, MA and a longtime member of VOICES Boston. He has performed with the Boston Symphony Orchestra and the Boston Lyric Opera and was chosen by composer Howard Shore to sing the boy soprano solos in last April’s Symphony Hall performance of Fall of Rings. Luther joined four other New World Chorale soloists including Michelle Trainor as soprano, Alan Schneider as tenor, Janna Baty as mezzo and Sam Handley as bass who delivered a rousing performance of “Ode to Joy” in Beethoven’s Ninth. All four soloists brought to the stage a repertoire of experience and refinery and delivered a powerful performance that rose in volume and intensity as the piece went on. The audience reacted with fervent awe and attention to their performance and, by the night’s end, they joined together in a standing ovation as Patel, the chorus and Symphony NH took their final bow. Though this was their last performance of the current season, Symphony NH will pick up again in September for its 20182019 season with a guest performance by the violinist duo Mark and Maggie O’Connor, along with a symphony performance of Mozart and Tchaikovsky.